Imagine if you could tell Sir Francis Drake that someday, people could sail around the world in under 100 days, with open bars, nightly comedy shows, and no scurvy. He’d probably ask, “What’s a comedy show?” then follow up with “Yeah, OK, and what’s next? Vacations on Mars?” Though leisure trips to the red planet quite aren’t quite yet a thing, once-unattainable round-the-world cruises most certainly are. More than a dozen cruise lines now offer months-long itineraries, stopping in more countries than most people see in a lifetime. If you have the time, money, and an affinity for buffets, there might not be a more efficient way to see the world. Curious? Here are the round-the-world cruises with space available, sailing now through January 2020. If your definition of cruising involves tropical islands with deserted beaches and swaying palms, Fred. Olsen’s world cruise is your move. This one starts out in the gloomy UK, then moves from Lisbon and Madeira to four Caribbean stops before heading down through Cartagena and the Panama Canal. From there it’s off to the beaches of the Pacific, with stops in Tahiti, Bora Bora and Vanuatu, before spending New Year’s Eve in Sydney. 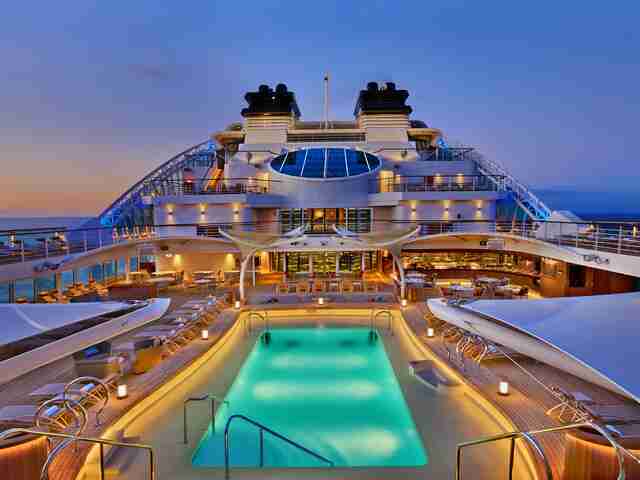 India, Oman, Jordan and Dubai are next before cruising the Med and ending up back in Southampton on February 28. 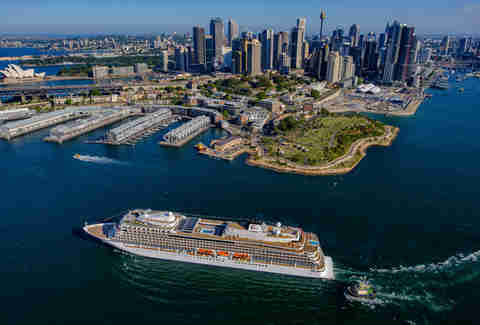 Azamara’s first-ever world voyage begins in Sydney, moving through Southeast Asia with overnights in Bangkok, Singapore, and Ho Chi Minh City, before stopping in India and Sri Lanka on the way to the Suez Canal. You’ll tour the Middle East, including three days in Dubai, then it’s off to the Greek Isles. Overnights in Monaco, Cannes, Lisbon, and Barcelona highlight the rest of the Med cruise before ending in Greenwich on June 17. If you’re not ready to get off the boat JUST yet, Azamara also offers a 13-day World Cup voyage that goes through Scandinavia on its way to Russia for the big fútbol tourney. This trip through the southern seas gets you into parts of the South Pacific you’d likely never see otherwise, with stops in Kiribati, Rarotonga in the Cook Islands, Samoa, Fiji, and French Polynesia. Try not to get confused as you cross the International Dateline three times before ending up in New Zealand’s Bay of Islands. You’ll cruise nearly the entire coast of Australia before heading to Indonesia and Singapore, then onto the Seychelles, Kenya, and Tanzania. There’ll be stops in South Africa before you wind up in Cape Town on February 20, 2019. Assuming, of course, they have water. 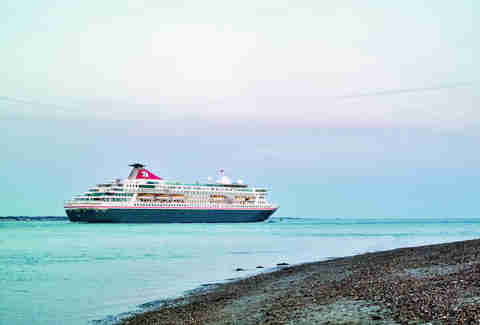 The cruise line that perfected the round-the-world cruise has but one true global offering in 2019, this 108-day marathon round-tripping from Southampton. You’ll cruise aboard the luxe Queen Victoria, heading from the UK to Bermuda, on to Fort Lauderdale and into the Caribbean and Cartagena. From there it’s through the Panama Canal onto Cabo and San Francisco, before crossing the Pacific with a stop in Hawaii. Tonga, New Zealand, and Australia are next before sailing to Singapore, Hong Kong, and Sri Lanka. Swim around the Seychelles before heading to South Africa, Walvis Bay, and Gran Canaria. You won’t stop on the European mainland, but you will end up back in Southampton on April 28. 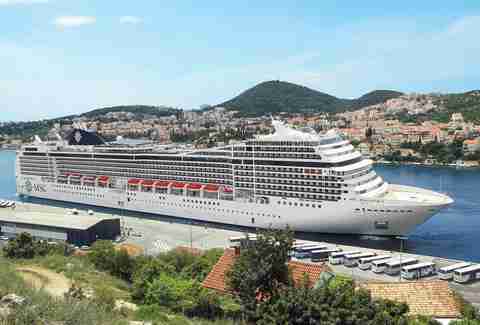 World cruises ain’t cheap, so if you had your heart set on taking MSC’s world cruise in 2019 but just couldn’t get the scratch, good news! It’s sold out! So you’ve got another year to save for this 2020 voyage in Italy. The South America-heavy itinerary skips North America entirely, with stops in Rio, Buenos Aires, Ushuaia, and Valparaiso before heading across the Pacific. 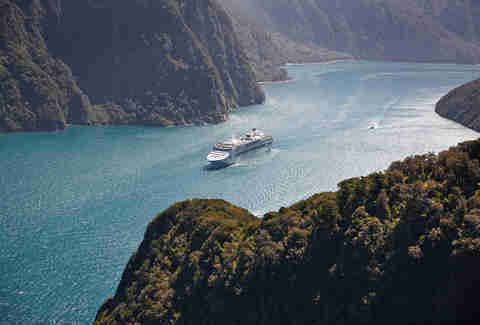 You’ll hit Tahiti and the Cook Islands before sailing to New Zealand, including a trip through Milford Sound. Australia and Bali are next, then Singapore, Sri Lanka, and Mumbai before crossing the Suez Canal on the way to Jordan. 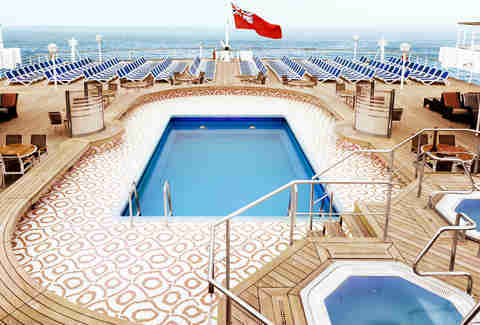 April 29 boasts your lone port in Italy with a quick jaunt to Civitavecchia before ending back in Genoa on the 30th. With a departure from South Florida, this world cruise has more stops in South America than most itineraries. After hitting Colombia and Panama on your way through the canal, you’ll make three stops in Peru and Chile before heading out to Easter Island. From there it’s on to the South Pacific and Bora Bora, before going south to Auckland, Wellington, and Sydney. It’s a straight shot through the Southeast Asian isles from there, through Java, Bali, Singapore, and Sri Lanka. Traverse the Suez Canal then hit the Med in Naples and Barcelona, before cruising up to the Norwegian Fjords, Northern Ireland, and back across the Atlantic to Florida on May 16. LA to New York sounds like a pretty basic American travel experience, unless of course you do it by traveling west. 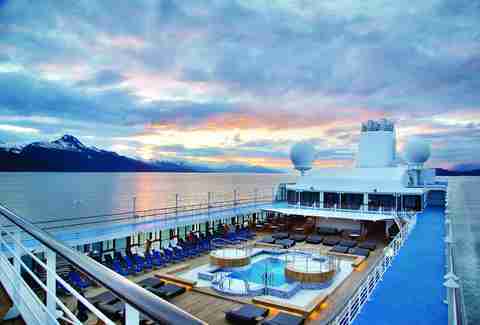 That’s what you’ll do for over four months, hitting Hawaii for four days before cruising to French Polynesia. After Bora Bora, you’ll stop in Tahiti and Fiji before spending about two weeks sailing around Australia, including an overnight in Sydney. March brings you to Boracay in the Philippines, followed by overnights in Hong Kong, Ho Chi Minh City, and Bangkok before beginning April in Goa and Mumbai. You’ll get to see a lesser-known part of the UAE in Fujairah before heading to Egypt, Jordan, and Israel. Close out April on the Isle of Capri, then on to May in Rome and Monaco before hitting Portugal’s Azores Islands on the way to Bermuda. You’ll end up in New York on May 15, the longest cross-country voyage of your life. This cruise hits some unusual ports for a round-the-world journey, with stops in Greenland, Prince Edward Island, Quebec City, and Easter Island during the latter half of the voyage. 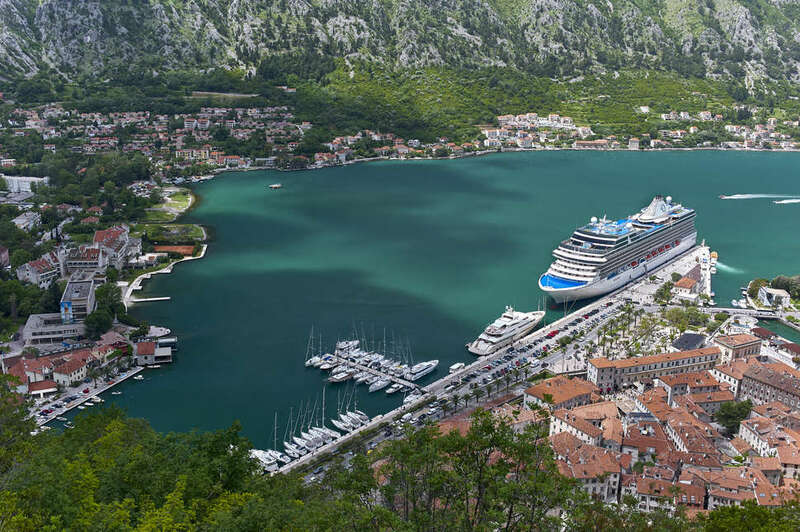 The first half hits Indonesia, Singapore, and Sri Lanka before cruising the Middle East and the Med, with stops in Ancona, Montenegro, and Sicily adding to the unusual itinerary. The transatlantic days at sea are kept to a minimum with the northerly route, stopping in Iceland and Greenland on the way to Newfoundland then down the East Coast. You’ll hit the home stretch in the South Pacific with stops in Tahiti and French Polynesia before finishing up in Auckland and Sydney. If you’re cool with spending half of 2019 on a cruise ship, there’s no better place to do it than the Insignia. The extended itinerary allows for lots of overnights, so you can explore ports like Shanghai, Hong Kong, Bangkok, and Bordeaux without having to rush back to the ship. The voyage hits all the right places during all the right seasons, with Havana, Cartagena, and Costa Rica highlighting January before starting February in Hawaii. You’ll cruise through the South Pacific with stops in Bora Bora, Samoa, and Fiji before going straight into southern summer in Bay of Islands, New Zealand. Enjoy the summer sun down under in Australia before heading to all those overnights in Asia, including April 7 in Seoul. The cruise also includes a stop in Israel as part of the Middle Eastern itinerary with Egypt and Jordan in May. June is spent cruising the Med before hitting Atlantic Canada in the height of its summer, when places like Nova Scotia and the Bay of Fundy are actually downright pleasant. You’ll end up back in NYC on July 5. 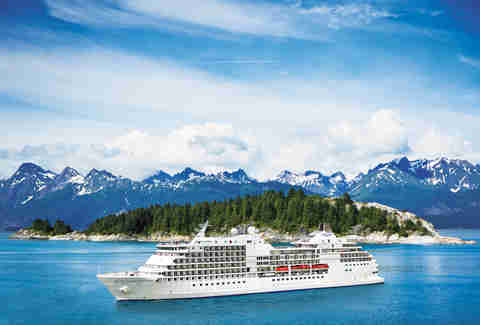 Silversea’s global cruise will be the apex of luxury: 132 days of fine food, luxurious cabins, and exotic destinations. Board the Whisper in San Francisco and head straight to the Marquesas Islands on the way to Tahiti. The route continues though the South Pacific, Auckland, and Sydney before sailing north to Asian capitals like Tokyo, Manila, and Ho Chi Minh City, with stops in Hong Kong and Singapore. Get some diving in during port calls in the Seychelles and Maldives before landing in Mombasa, Kenya. It’s the first of 13 ports in Africa which also include Madagascar, Acora, and Casablanca. You’ll finish along the coast of Western Europe with days in Lisbon and Bordeaux before ending in Greenwich, UK on May 19. The cruise line best known for its river expeditions expands that reach SLIGHTLY in 2019 with this new world cruise. The Miami departure lends itself to lots of South American stops, with an overnight in Rio, a trip to Uruguay, then another overnight in Buenos Aires. The disputed Falkland Islands are next, before cruising around Cape Horn and up into the Chilean fjords. You’ll be in Chile nearly two weeks with an overnight in Santiago and a trip to Easter Island, then on to French Polynesia and an overnight in Auckland. Spend nights in Sydney and Perth before cruising the Indian Ocean to Mozambique and Madagascar, then sail around Africa with stops in Senegal and Morocco. Your last stop will be Spain -- including the beaches of the Canary Islands -- before ending in Greenwich, UK. The most time-efficient world cruise over the next couple of years is this western journey, that starts and ends in the UK. From Southampton you’ll hit Madeira on your way to St. Lucia and Aruba, then through the Panama Canal to Cabo, San Francisco, and Honolulu. South Pacific stops include Apia in the Samoan Islands on your way to Sydney and the Great Barrier Reef, before heading north to Japan with port calls in Kagoshima and Nagasaki. The beaches of Hoi An are next before Singapore and Sri Lanka, then on to Mumbai, Muscat, Dubai and Haifa, before returning to Southampton on April 16.